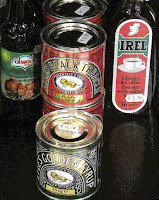 The aim in Bandon’s URRU is to help you enjoy shopping for food and food related items. The formula is a successful one in this bright well laid out shop. Called there last Saturday and enjoyed the visit, the browsing, the shopping, and the chat with Ruth and the coffee. Not to mention the gorgeous Patisserie Regale Dunmanway made giant Ginger Spice Cookie that accompanied the coffee. Shopping for food is easy here as some of the great local names are suppliers: Glenilen, Jack McCarthy, Ummera, Arbutus, Green Saffron, Macroom Mills and many more, including the cheesemakers. 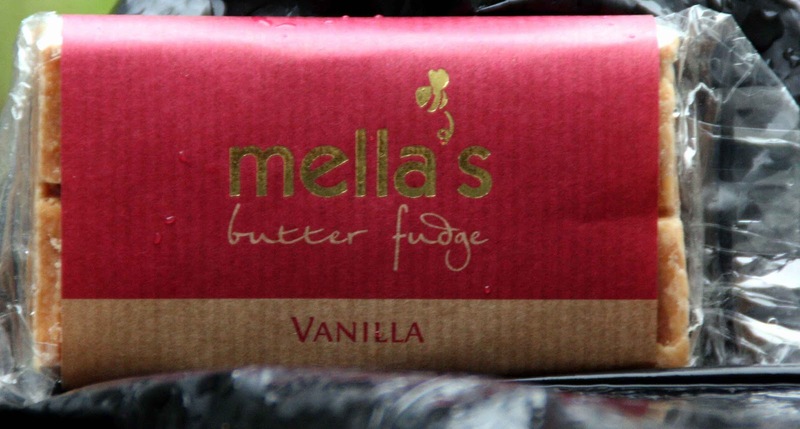 Oh, and not forgetting Mella and her irresistible fudge. Ended up with quite a bagful, as usual. There was a sale on in the kitchenware “department”, 50 per cent off on many items, and we got one or two bits and pieces. URRU also have a collection, an impressive one, of cookery books and also a good wine corner. You won’t go short here. Vegetables? That department is now well covered too at the URRU Greengrocer which is more or less next door to this lovely not so little shop on McSwiney Quay. We had a look in there too. 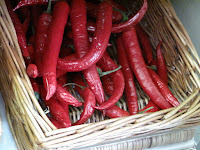 Lots of local vegetables and also enticing imports such as figs and hazelnuts. Vicky Jago has been in touch with a gift idea from Good Food Ireland, a Unique Gift this Valentine's! "If you love good food, then look no further than a Good Food Ireland gift voucher which allows you the freedom to choose from over 300 Good Food Ireland approved providers located around the island of Ireland. 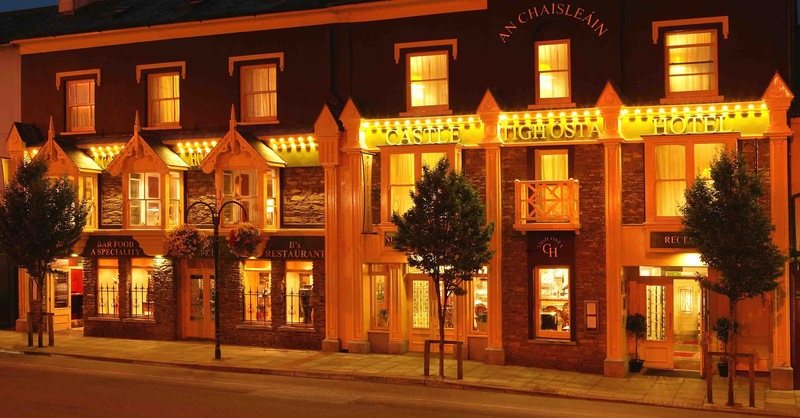 They promise you an experience of the very best in Irish cuisine and hospitality. Whether you are looking for a romantic break, an intimate meal, a relaxing spa weekend or a dinner in a famous Irish eatery or just pure food indulgence this is the ideal gift for everyone who simply loves good food! Good Food Ireland gift vouchers starting from €10 are available to purchase through the Good Food Ireland office Tel 053 9158693 or Online www.goodfoodireland.ie"
Smoked Chicken @ Urru Culinary Store, a photo by CorkBilly on Flickr. 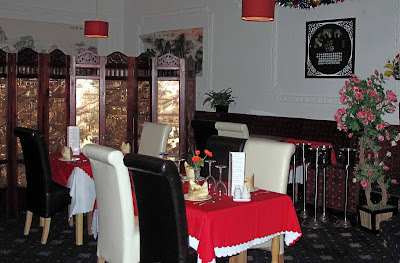 Friday last, we dined at the B’s Restaurant in the Castle Hotel in Macroom. And dined quite royally, I might add. Food and service were terrific. Service came in the shape of AJ, the maestro of the dining room. No shortage of advice or recommendations and, if something wasn’t on the menu, then he’d get it as he did with the fruit dessert at the end. Lots of friendly chat too, “like”. As we munched the handmade breads, from a “secret” recipe according to AJ, I was delighted to see so many local producers mentioned on the menu, reliable sources such as Jack McCarthy, Cappoquinn, Ardsallagh, Gubbeen, Milleens, Michael Twomey and quite a few others. 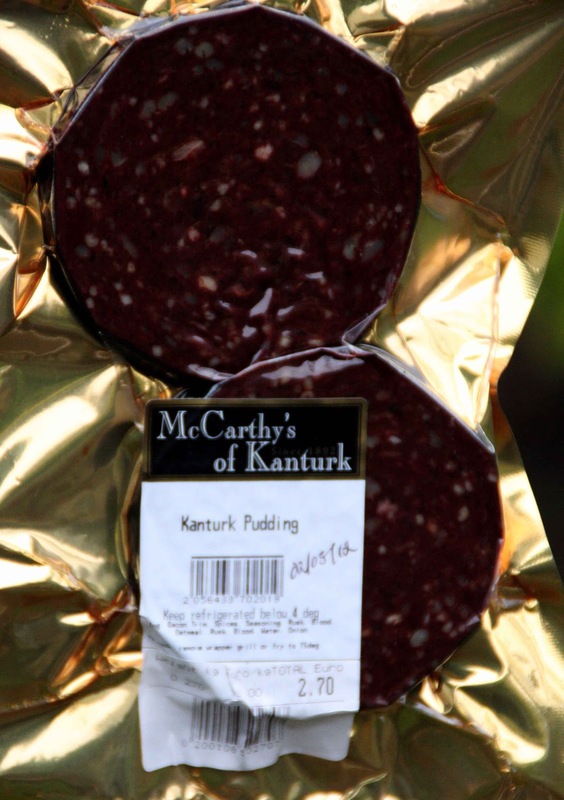 I started off with the Jack McCarthy Black Pudding, which was perfect, as usual, really top drawer stuff. 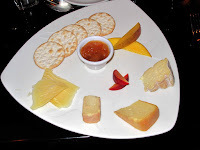 This time, it was served with a Spiced Apple Chutney, a great match. Local input also to the other starter with the mozzarella coming from the milk of the buffalos on the farm of local man Johnny Lynch. The full title for this starter was: Mozzarella and Roasted Vegetable Bruschetta with fire roasted pepper relish and baby leaf salad. Another good one! Peppers and Aubergine were the roasted veg and the whole thing came together very well indeed. AJ then humourously explained, just in case we thought the meal was coming to a premature end, that the next course would not be dessert but a sorbet. And quite a tasty and colourful one it turned out to be. 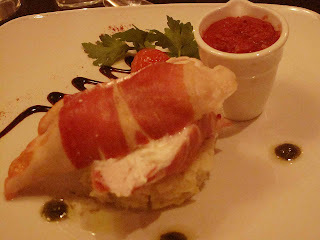 Now, the palate was ready for the mains and I went for an AJ recommendation: Baked Supreme of Cappoquinn Chicken filled with Ardsallagh Goats Cheese wrapped in Parma Ham and served with a Tomato and Basil Sauce. Must say I liked this one. The cheese played a key role in the overall taste without ever threatening to dominate while the sauce – I spooned out every bit – added extra flavour and moisture. I like it too that the sauce was served in its own little container as was the case with the other main dish: Baked West Cork hake with sundried tomato salsa and served with a light Champagne sauce. The fish was juicy, the spinach underneath was lovely and creamy while the salsa added a bit of tartness. The main dishes were also accompanied by a side plate of perfectly cooked seasonal vegetables. Now for the real dessert. Once again AJ played a part as one of us was looking for something light. 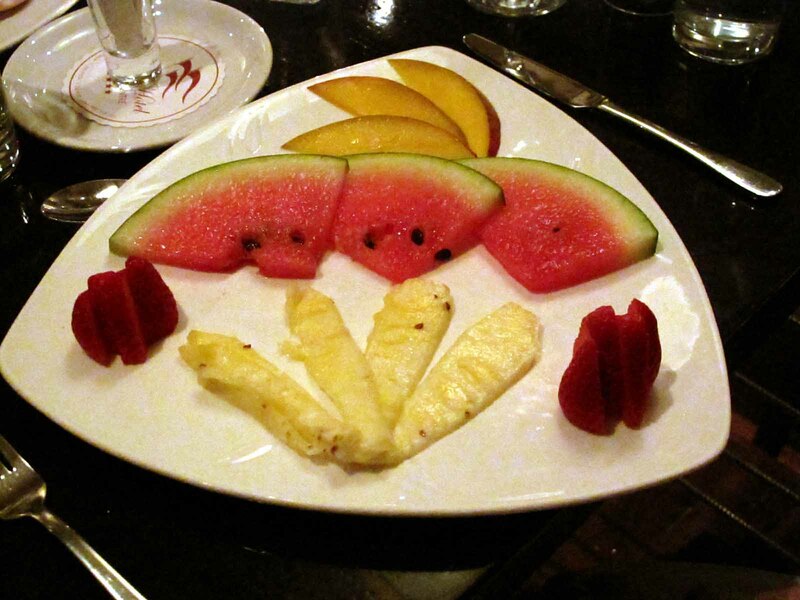 And so he got the chef to produce, without any delay, a perfectly presented plate of gorgeous fruit, as you can see from the picture. I too had a gorgeous presentation, quite a line up of local cheese, including top names such as Milleens and Gubbeen, crackers and plum chutney and some slices of plum and mango. Lapped it all up while finishing off the wine which was another treat, the real face of Chardonnay from Burgundy. For the record it was a Champy 2009 Macon-Lugny (€26.00). 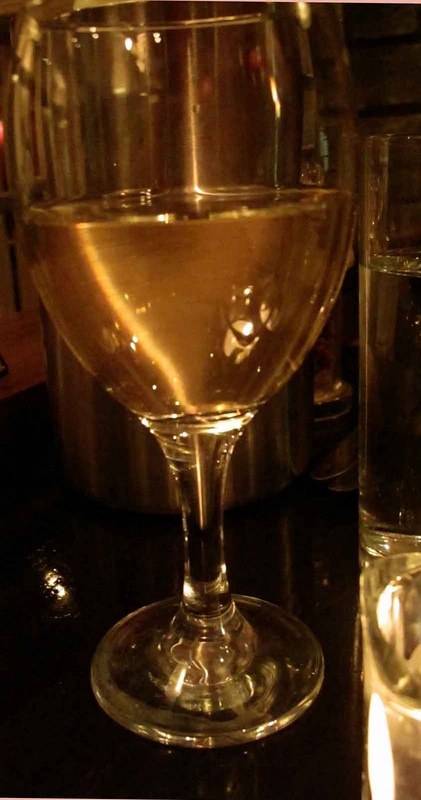 It was full-bodied luscious and creamy, not a trace of oak, the real taste of one of the world’s most popular grapes. Lovely wine, lovely meal. Thanks to AJ and all the crew at the Castle. Celebrated the coming of the Year of the Dragon, a little on the late side, with a very tasty meal indeed at Ying’s Palace in Mayfield last night. This is a really well appointed restaurant with a high degree of space and comfort and consistently good food. But, like many Chinese establishments, the take-away business outshines the sit-down! Amazing really that Chinese cuisine, which is so well established in Ireland, has not really crossed over to our regular restaurants. 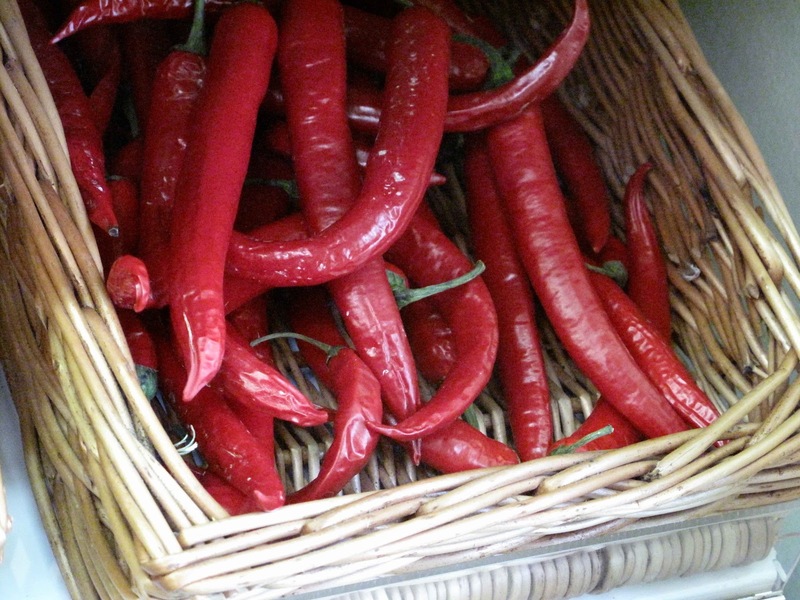 We’ve got a huge French input, a substantial Italian and Spanish influence, quite a hefty contribution from the Maghreb (cous cous, tagine) but very little from the Chinese. I was thinking that when our starter arrived. By the way, we had picked one of the set menus which included a glass of wine for a total of €22.80. They have other marginally cheaper set menus along with a four course multi-choice special offer for just €15.59, a great way to try out the place. Getting back to last night, we started off with a plate of irresistible Prawn Crackers. Polished them off quickly and there was precious little resistance when we were offered a second plate by our very friendly hostess. Then on to the substantial main starter: Crispy Aromatic Duck (served with strips of spring onions, cucumbers, carrots, pancakes and Hoisin Sauce). 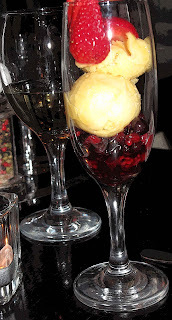 I really enjoyed this, a terrific combination and one that might catch on in mainstream restaurants! Finger wipes were supplied as standard service. Next up was a big bowl of very warm soup: Crabmeat and sweet corn. Just what you’d need on a showery wintry evening, really excellent. By this stage, I had sipped my last drop of the free wine, a very acceptable Cabernet Sauvignon from Valle Andino (Chile). A glass would normally cost €4.90, a bottle €16.80. Good prices! They had Chinese beer listed on the menu at €3.90 a bottle. Tsingtao is bottled in China and has the usual ingredients, except that rice is added. The rice seems to give it extra flavour and roundness and I must say I absolutely enjoyed it and wouldn’t mind getting my hands on a few. The other beer that we got was Tiger. This regular lager is brewed in Singapore and more widely available and very drinkable. 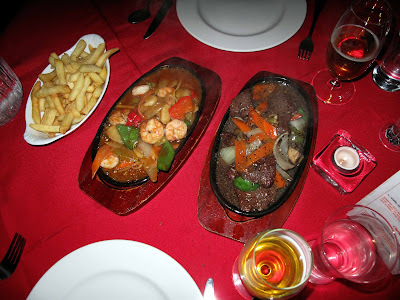 So now, we were ready for the double barrelled main course: Fillet beef with black pepper sauce and King Prawn Szechuan, both served sizzling! And accompanied by either chips or fried rice. We took one dish of each. Loved those prawns, each a soft explosion of taste redolent of the sea and complimented by the other flavours. The beef – all their beef is Irish – was so tender I could have cut it with a spoon and so tasty. 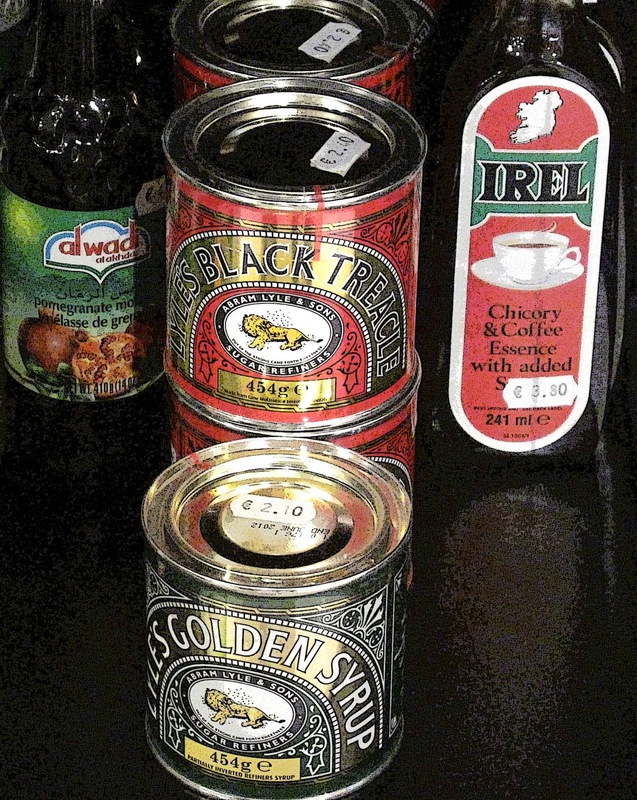 The black pepper sauce is what it says on the tin so you’d better be aware of that before you order. We enjoyed every piece. Now we were full and had just begun to sip our coffee (included) when our hostess came to the table with a slice of homemade cheesecake, on the house! We wished her well for the New Year, hoping the Dragon would be kind to her. “I hope he will be kind to all peoples,” she graciously replied. And so say all of us. A big thank you to JoeKarwig in Carrigaline who imports this excellent New World Shiraz, a terrific wine. And thanks also to that well known butcher, Pat Whelan of Clonmel, and now also of Monkstown (Dublin), as it was from Whelan’s on-line shop that I got the ever so tender lack of lamb that I matched with the Morambro Shiraz . The dark red wine is smooth and lush from start to long finish. It has a pleasantly aromatic nose. The introduction to the palate is excellent. This is a very well made wine indeed with rounded fruit flavours and spice, all in balance, nothing overly restrained and nothing extreme. Easy to enjoy. The know-how of five generations of the Bryson family has gone into this one and they are justly proud of their methods and of the wine itself. They also say that it is best with food and you won’t get a much better match than the one I enjoyed. Jean Louis Smyl of Famille Quiot in the (Rhone Valley) was the star of the evening when the Hayfield Manor Wine Society held its inaugural dinner in the hotel last November. Ballymaloe's Samuel (left) and yours truly. pic: Colm McCan. Sommelière Sandra Biret-Crowley, who did some great work behind the scenes in organising the event, will have the help of Donie O’Brien from Erne Drinks Company when the next dinner takes place on February 23rd. Donie’s visit also signals a change of country as the wines from the awarding Santa Sofia winery in Italy will take centre stage on this occasion. Hayfield’s Paul O’Connell is rightly proud of their wines: “We view wine as a vital part of the Hayfield Manor experience, and the superb cellar kept by our Sommelière Sandra Biret - Crowley, is a source of delight for experienced wine buffs and enthusiastic amateurs alike. Enthusiasts looking to expand their knowledge of wine, or amateurs who simply love sampling new and exciting vintages, will relish the special wine events that are a regular feature in Hayfield Manor. Our exceptional suppliers regularly host events that offer an informal but informative exploration of the world of wine, especially some of its less well known delights, with plenty of entertainment to be enjoyed along the way. This special Santa Sofia wine dinner begins at 7.00pm with aperitifs and an introduction to the wines of the estate which is in Italy’s historic Valpolicella Classico region between Venice and Verona. It includes an ancient villa dating back to 1560. Dinner is €79.00 per person which is served from 7.30pm and includes a 5 course menu specially created by the Executive Chef, Graeme Campbell, to complement 5 different wines. "The Castle beat off stiff competition and was voted best bargain hotel by Trip Advisor this week in its annual Trip Advisor Travellers’ Choice Awards. The Castle Hotel was ranked within the top twenty five hotels in Ireland in the “bargain” hotel award category by Trip Advisor. The Castle is no stranger to Trip Advisor and last year was awarded a Certificate of Excellence for 2011. The prestigious awards are run on an annual basis by Trip Advisor, which is the world’s largest travel community, where millions of travellers seek information on all items travel related." For further information on this exclusive deal contact The Castle Hotel on 026-41074. Amuse Bouche: Do Not Stay Long After Eating!!! "Happy new year! Sow and Grow have wonderful plans for Spring 2012, including gardening workshops for teachers, childcare providers, parents and kids and fabulous birthday party ideas. We are also working with people of all ages in communities, helping to set up and provide training in community gardens. I would love if you would have a read of our Spring newsletter, it may inspire you to get growing your own!" 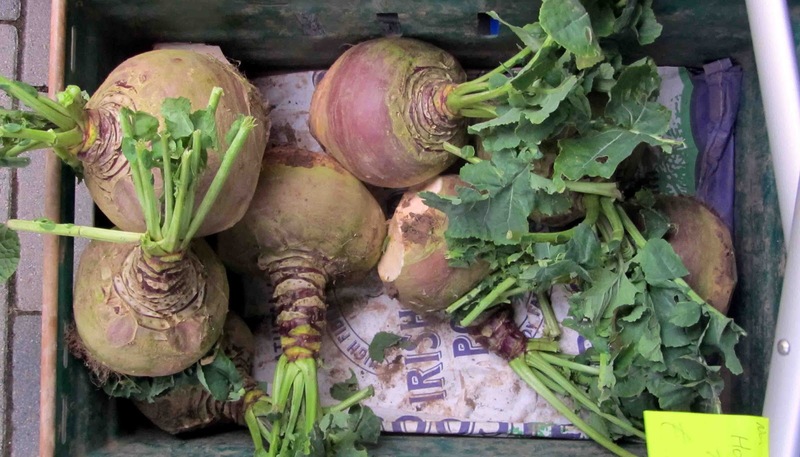 Last time, I wrote about the Farmgate, I headlined the piece: Great balls of flour. The “balls of flour”, were there again today: Golden Wonders with skins intact. I cut one in half to demonstrate to my two UK guests what is meant by the phrase. I must admit that the potatoes didn’t form part of my own dish but I did take a half, just because I couldn’t resist They are just as gorgeous now as they were last November and illustrate what the Farmgate is all about: local produce in good nick, cooked to perfection and served by a friendly and efficient crew in this busy day-time restaurant overlooking the English Market. 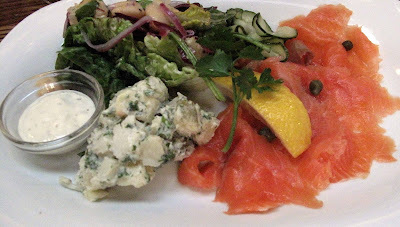 My main course is a regular on the menu: Old Millbank Smoked Organic Salmon (12.50), served with a cracking salad and Crème fraîche. 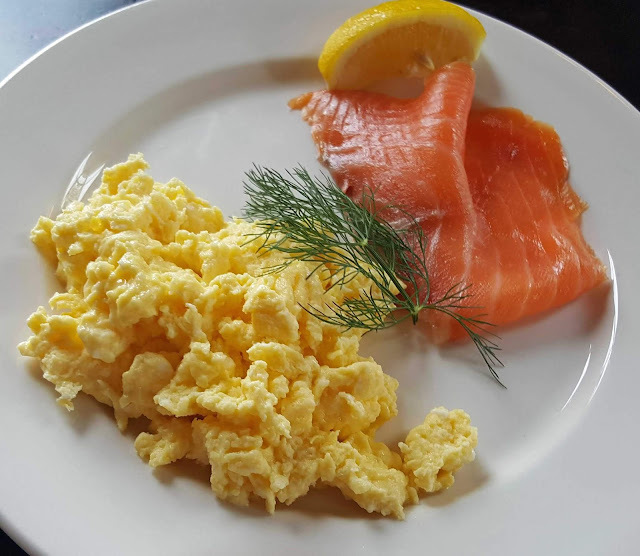 Old Millbank are regulars at Mahon Point Farmers Market and their salmon is always top notch as indeed it was here. The menu description of the salad wasn’t exactly spot-on but the dish itself was and I and one of my fellow diners were very happy with it. 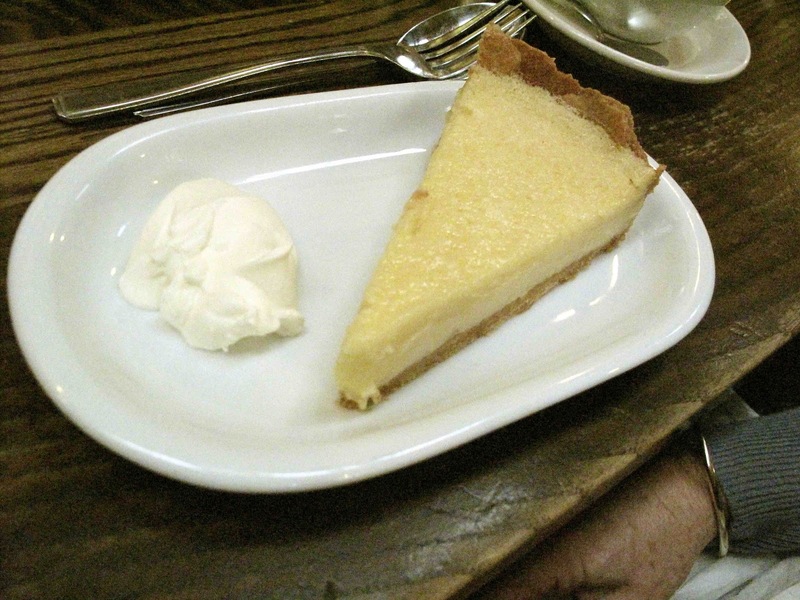 One of the visitors enjoyed the Lamb’s Liver and Bacon and the other polished off one of the specials, the Cod pie. Two of us, myself included, went for the fruity Porter Cake with the coffee; one picked the light and tempting Lemon Tart while another choose the Fruit Crumble. Four empty plates, four happy customers. 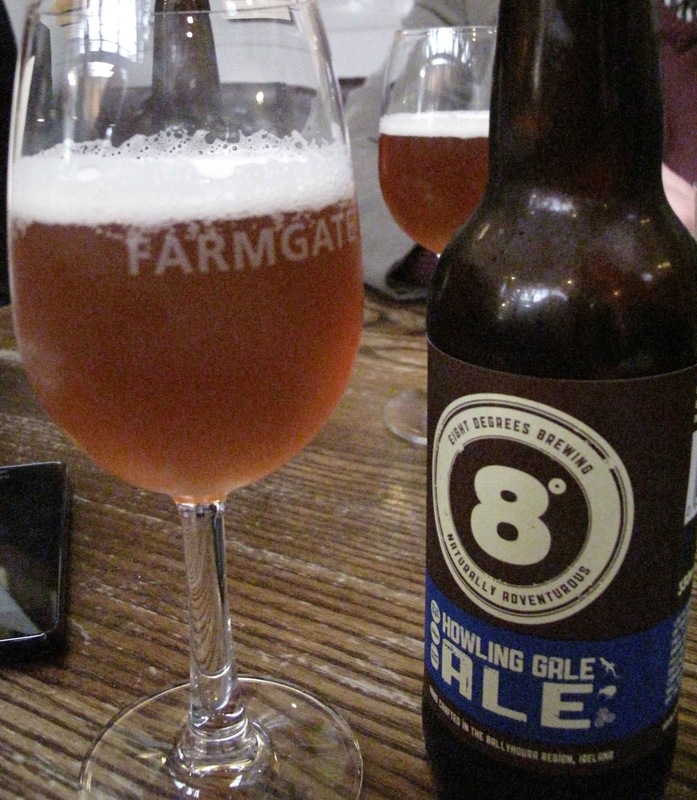 Just wonder – didn’t check – if the Porter cake was made with the Knockmealdown Porter by the 8 Degrees Brewing Company. They sell that here but it was the same company’s Howling Gale ale that I imbibed with my main course. Must say, I’m getting to really like that after some initial ambivalence towards the Mitchelstown product. But never any ambivalence with regard to the Farmgate. Top class. Happy New Year, With Rosé en Primeur! Just got a Happy New Year card from the folks at Laurent Miquel vineyard near Beziers. Dominique is one of the signatories and she explained to me previously that the French spread out the New Year Celebrations over the first few weeks. No rush there then! 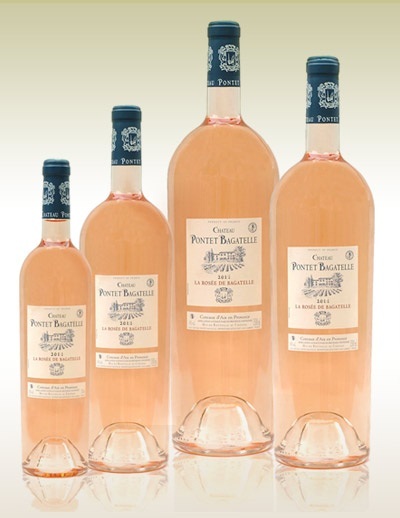 Three years ago From Vineyards Direct launched what is now a traditional “en Primeur” release of new vintages of Pontet Bagatelle Rosé, raising a good few eyebrows by introducing pale pinks into what has often seemed to be the preserve of more ‘serious’ wines from a particular left or right bank. The wine can be purchased at the remarkable price of €51 in Bond. This is €45 less than the price of the 2010 vintage as fromVineyardsDirect have been able to purchase the majority of the harvest this year – and Garry wishes to thank FVD customers. This stunning Rosé will also be available in Magnums, Double Magnums and Imperials. The larger bottles add a touch of drama as well as flavour to any party, reception or wedding. Germany, Alsace and the Clare and Eden Valleys in Australia are noted as great places to grow Riesling. But Western Australia can also come up with the goods as evidenced by the Tingleup below. It won Decanter magazine’s Regional Champion Award for the best Australian Riesling on sale in the UK at under £10.00 and is one of a few I've tasted recently. Karwig Wines in Carrigaline is probably the best place in Ireland for Riesling and they have some very good ones indeed, including the Kerpen Riesling Blauchiefer Trocken 2010, 11.5%, €12.69, a well priced favourite of mine. Must try older ones like this! I also enjoyed their Mehrlein. Nose is aromatic with a slight hint of the famous petrol. The intro to the palate is lively and fruity, crisp and fresh, lime and apples to the fore with an almost perfect balance of sweetness and acidity and it comes complete with a decent minerally finish. Perhaps practice makes perfect in this vineyard as 95% of the output is Riesling. A good wine at a good price. The Bird in Hand has that petrol, both in the aroma and on the palate. It also has more fruit than the Rheingau but still holds a good balance. It also has more body, maybe less liveliness, and that petrol is always there. This estate grown limited release is classed as a premium wine from an area renowned for its Riesling. The Tingleup bottle comes from an area better known for excellent Chardonnay and Cabernet Sauvignon but one can see why it won the Decanter award. It is fresh, fruity and dry with a fine long finish. Apple, pear and lime combine to give the refreshing tingle (this one is well named) and the finish echoes the introduction. And so my Riesling education continues. At present, I have to say that I prefer the younger ones, such as the Kerpen and Tingleup. But I’ll have to get my hands on more of the older ones and see how it goes. By the way, the Eden Valley topped the Riesling charts in Decanter for the over £10 category. The winner was Peter Lehmann’s Wigan 2005. Not too sure who sells that in Ireland. 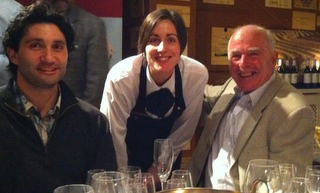 According to both Hugh Johnson and Oz Clarke, Howard Park is one of the top producers in the Margaret River area. They make this Tingleup but you’ll need your glasses on to see their name on the label. Still, this is a top Riesling. And well priced. I enjoyed a lovely meal at The Barn last evening. 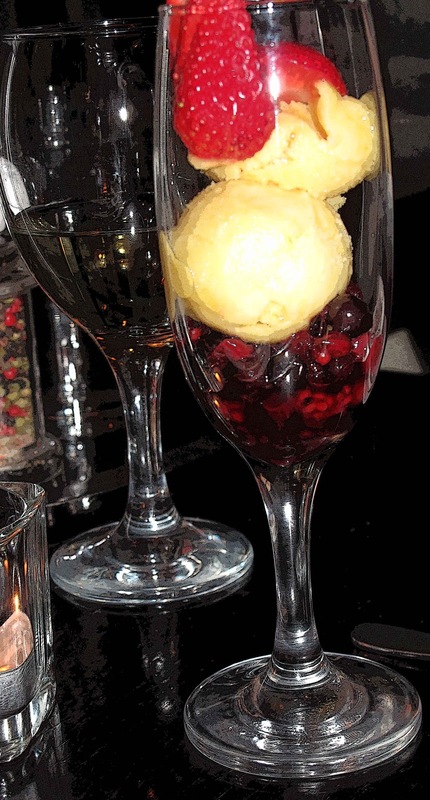 For over thirty years, the venue, on the Mayfield to Glanmire Road, has been a fixture on the Cork dining scene. And that kind of longevity doesn’t happen by chance. This is a comfortable place, starting with the ante-room where you may take a seat and check the menu while sipping an aperitif. The coats are put away neatly in the cloakroom and you are led along the carpets to your comfortable chair as the live music from the piano-man fills the room (not especially for your entrance, of course). Service too is excellent, leisurely but not laggardly. For instance, when the main course was being served to our group (4), three people, maybe four, appeared with the dishes and, within a few seconds, all four of us had our main plates, along with the side plates of veg, in front of us and the water had been refilled without our asking for it to be done. And all done with a little chat and a big smile! But all this comfort and service, even the piano-man, would count for little unless the food is good. And it is. It has of course moved on quite a bit from the early days of The Barn and now you see words like wasabi, tapenade, hummus and pork belly on the extensive menu. All four of us were very happy with the meal. 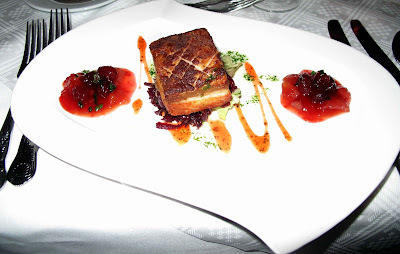 After some nice breads, I started off with the Crispy Pork Belly with Sour Cherry and Plum Chutney and Caramelised Red Onion (about €7.50, forget the exact price). Absolutely top class, done to a T, and the chutney was so moreish (even though I got two decent scoops of it!). Then on to the piece de résistance! This was the Tapenade crumbed Cod Fillet, with Chablis Sauce and Spiced Mango Chutney (€21.50). Quite a decent sized piece of fish and there was also a side dish of nicely done vegetables (potato, carrot and creamed broccoli). Must say I really enjoyed it, the combination on the main plate was gorgeous. Quantity and quality was spot on here and left no desire for anything else, though I did look longingly at the famous dessert trolley that we passed on our exit! The ‘2012 Beer Loves Food Series’ kicks off at the Cornstore, one of Cork’s most popular restaurants to celebrate the naturalness of beer and food matching. Beer and Food enthusiasts will be taken on a journey of beer tasting, beer history and food matching by Master Beer Sommelier, Marc Stroobandt, from Belgium. The ‘Beer Loves Food Series’ was created by Heineken Ireland to deliver on the growing global trend of beer and food matching. Marc has been awarded some of the highest accolades in the global brewing industry. He has been given an honorary knighthood by the Chevalerie du Fourquet des Brasseurs of the Confederation of Belgian Brewers and the title of Commander in the Order of De Roze Olifant. Marc hosted a similar event here in November and I found it to be a very enjoyable evening indeed as you may read here. Beer is a natural accompaniment to food both savoury and sweet, with its ingredients of hops, barley, water and yeast. At the Cornstore, matchings like braised lamb shank with Affligem, an Abbey Ale with spicy and citrus flavours; slow roast pork belly withTiger, an Asian pilsner-style lager with hoppy flavours; and white chocolate mousse with Paulaner, a Bavarian Weissbier with fruity flavours and a crisp dry finish will reveal how beer and food complement each other to create unique and surprising taste sensations. The ‘Beer Loves Food Series’ was created by Heineken Ireland, Ireland’s number one lager company, to deliver on the increasing demand for deeper understanding of beer and food matching. Log on to www.thisisbeer.ie for more information. With Zywiec - The malty sweetness of Zywiec compares well with the creamy parfait, while the hoppy bitter dryness can cut through the richness of the goats cheese and the soup. With Heineken - The crisp, lemony slightly spicy hoppiness of Heineken blends well with the fish and uplifts all the other flavours. With Zywiec - The sweetness of the chicken matches the beer and brings together the other flavours without overpowering them. 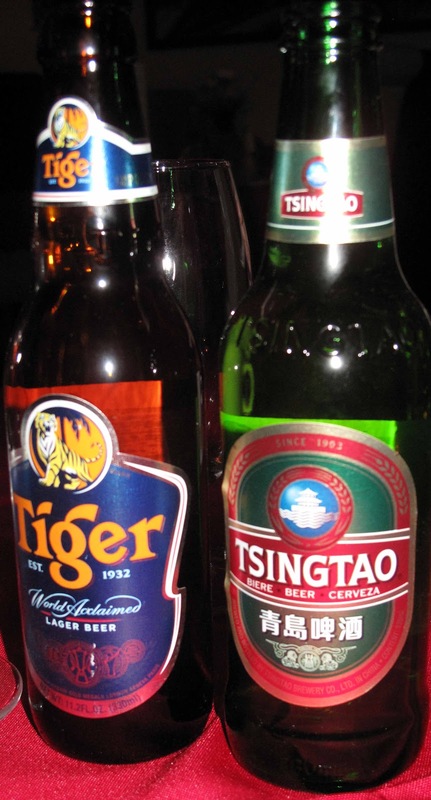 With Tiger Beer - The richness of the dish requires the complexity of the beer and the well balanced bitter-sweetness of Tiger can handle the variety of ingredients while the spicy notes add another dimension to the dish. With Affligem - The honey bitter sweetness of Affligem acts like a seasoning for the lamb while the light tartness of the beer cuts through the other ingredients. 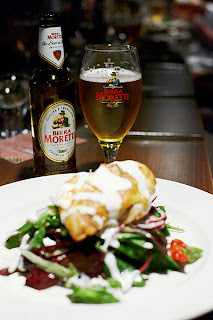 With Birra Moretti - The sweetness of both the beer and the dish marry well together whilst bringing out the spicy peppery flavours of the pesto and rocket. 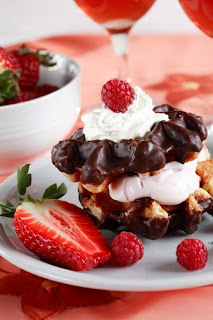 With Paulaner - The silky creamy texture of Paulaner and its honey-like sweetness with a lemony touch create a great combination bringing out the gorgeous flavours of both the mousse and the strawberries. TV3's COME DINE WITH ME. WILL YOU?